Deadline day signing James Tarkowski has vowed to prove his worth by helping the club achieve its vision of returning to the Premier League. The 23-year-old defender penned a three-and-a-half year deal at Turf Moor after joining from Championship rivals Brentford for an undisclosed fee. The Manchester-born centre-back, who started his career at Oldham Athletic, went agonisingly close to reaching the top flight with the Bees last term but eventually lost out to Middlesbrough in the play-offs. Now, with a second bite of the cherry in the offing with the Clarets, Tarkowski is hoping to go one better. “The Premier League is the aim,” he said. “That would be ideal and then the next aim is to stay there. “We’re in and about it at the moment so we have to kick on from where we are now and move up the league into the automatic positions. “A top two finish would be nice in an ideal world, but I’m sure if we get to the play-offs we’ll be backing ourselves to go up through that route as well. “We’re definitely equipped for it. From watching them this season, and having played against them earlier on, you can see the experience and the talent in the squad, and hopefully I can add to that and look to go on and get promoted. “For me personally I want to give my best and achieve my best and show my value to the club. 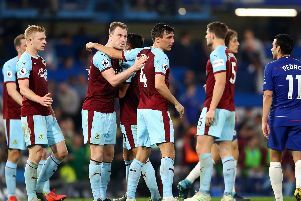 The club’s newest addition, who will don the number 26, attracted the interest of Burnley boss Sean Dyche during the winter transfer window two years ago while plying his trade at Boundary Park. That interest didn’t amount to anything substantial and Tarkowski moved to Griffin Park. However the defender, who has Polish heritage, is delighted to finally get his move following an excrutiatingly drawn out affair. “It’s not easy at times but everyone has got personal problems in their life which they have to deal with,” said Tarkowski, who was subjected to disciplinary action at Brentford after missing the Championship defeat to the Clarets last month. “I’ve been able to do that and to be fair to Brentford they helped me out quite a lot, as much stick as I’ve got they did help me and I appreciate that. “This is something that has been around for quite a few years now. Before I moved to Brentford there was interest then but it never quite worked out. “It’s dragged on a little bit, more than I would have liked. I’d have liked to have got it done as soon as. “You’ve just got to be patient and wait it out. I’m happy to be here and be among the lads and I want to get involved as soon as I can. Tarkowski’s first challenge will be to try and break in to a back four that has shut up shop of late. The recently refurbished rearguard has record three clean sheets in six outings, conceding just three times in that sequence. “You’ve got to wait for your chance,” he said. “I can’t expect to turn up and stroll straight into the team. “I’ve got to keep myself fit, get working hard and hopefully when my chance comes around I will do well and keep my position. “You’ve got to compete against your team-mates as much as you do when you get out on the pitch on the Saturday. Tarkowski, who made 89 appearances for the Latics and 74 outings for the Bees, where he played alongside Andre Gray and Chris Long, added: “If he (Dyche) has watched me over the last few seasons he’s seen me improve from my Oldham days. “He still likes the player I am now, which is pleasing, it’s great to have a manager that likes you. “I like to play football, but as you see with most defenders these days you have to do it at the right time, which is something I’ve learnt over the last couple of seasons. Tarkowski was ineligible for selection to face Sheffield Wednesday at Hillsborough midweek having signed after Monday’s cut off point. However, he’ll be in contention to make tomorrow’s 18-man matchday squad as the Clarets take on promotion rivals Hull City on home soil.